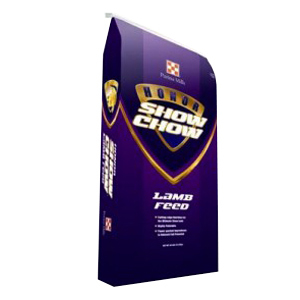 Honor Show Chow Showlamb Breeder Developer Pellet DX provides well-balanced, well-fortified nutrition for developing breeding sheep without adding excessive body condition. It is pelleted and medicated with Deccox to prevent coccidiosis. This feed is intended for breeding sheep requiring lower energy. Honor Show Chow Showlamb Breeder Developer Pellet DX feed is supported by Purina Mills AnimalNutrition. Get your best animals on Honor Show Chow Showlamb Breeder Developer Pellet DX pellet feed today so they can reach their full potential. A true, fully fermented yeast culture developed specifically for optimum animal nutrition. Research proven, Diamond V has a unique ability to enhance ration digestibility, palatability and intake by delivering a rich, all-natural nutrient source to the animal’s digestive bacteria. Honor® Show Chow® Showlamb Breeder Developer Pellet DX a rate of 2 to 4% of bodyweight, depending upon the desired growth and body condition. This feed is designed to provide 22.7mg Decoquinate per 100 lb. bodyweight per day. In addition, offer about 1/4 to 1/2 lb per head per day of good quality long stem forage. Always provide an unlimited supply of clean, fresh water. Warning: Do not feed to sheep producing milk for food. Caution: Do not use in feeds containing bentonite. Limitations: Feed at least 28 days during periods of exposure or when experience indicates that coccidiosis is likely to be a hazard. Reminder: Feed is perishable and should be stored in a clean, dry, well-ventilated area so it will remain fresh and palatable. DO NOT feed moldy or insect infested feed to animals as it may cause illness, abortion or death. Fresh, clean water should be available at all times.